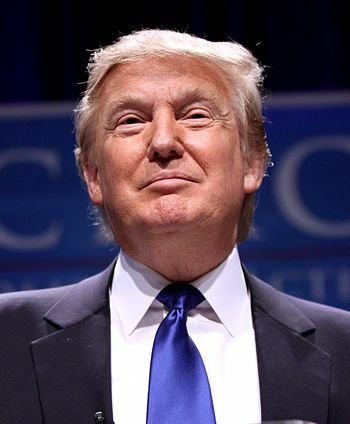 In his message to Congress describing “An American Budget,” the president started off accurately enough: “The current fiscal path is unsustainable, and future generations deserve better.” Translation: If this budget isn’t approved, wage earners will not only have to hide their wallets but their grandchildren as well. He added: “Over the next decade, a steady rate of 3-percent economic growth will infuse trillions of additional dollars into our economy, fueling the dreams of the American people and sustaining a new era of American Greatness.” And, hopefully, enough vastly increased tax receipts to pay for it. On the surface, the White House’s plan to rebuild America’s failing infrastructure looks like magic: The job is going to cost $1.5 trillion, but the federal government will only have to “invest” $20 billion each year for the next 10 years to get the job done. The rest will come from states and local municipalities in response to various “incentives” through the grant process. Additionally, the White House’s proposed plan will cut the permitting process down from the usual 10 to 13 years to just 24 months — 21 months to consider the project and three months to approve it. It also relies heavily on the concept of “public-private partnerships” to fund the program. With Wall Street regaining its footing following the decline that started last Thursday, commentators in the mainstream media are still searching for the decline’s cause. 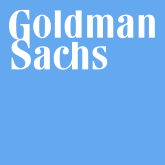 Initially they claimed that it was an unexpected surge in inflation evidenced by the rise in the yield of 10-year U.S. Treasury notes approaching three percent (in early September it was closer to two percent). This was followed by the jobs report that announced that wages increased 2.9 percent year-over-year, up from just over two percent previously. Writers at the Wall Street Journal dug deeper: The selloff was caused by — ready? — “volatility sellers, risk-party funds and algorithmic trading.” They then went into mind-numbing detail about how these strategies work and how the crash cost people using in them in excess of $200 billion. All manner of explanations for the recent market selloff in stocks have come out of the woodwork: the market has gotten ahead of itself; it was due for a correction anyway; it’s been 400 days since a three percent correction; and so on. The least informed is that all of a sudden there is inflation! See? The yield on the 10-year Treasury is up 80 basis points since September! That must mean there’s inflation! Couple that with the “surge” in wages just reported by the Bureau of Labor Statistics (2.9 percent year-over-year compared to 2.2 percent reported previously) and – voila! – inflation is back. Time to take profits! Apple’s Repatriation of Its Profits: Talk About Stimulating the Economy! After paying the world’s largest tax bill – $38 billion – Apple, Inc., the world’s largest company by market capitalization and now the government’s largest taxpayer, will have $214 billion left over. Apple announced Wednesday that not only would it repatriate nearly all its foreign cash holdings under the new tax reform law, but it was going to put a lot of it to work right away. This puts the lie to anti-capitalists who predicted that such a plan would only further enrich the already rich. Instead Apple is going to spread the repatriated funds around, announcing that it would not only be creating new jobs but would be building new facilities and expanding its financial commitment to the company’s “innovation” fund. It also is expanding its efforts to reach students in high school to teach them coding language (for free) so that many of them will be able to provide Apple with the coders and software developers it will need as it expands into the future. Buried in the latest report from the Department of the Treasury is this nugget: Through the first two months of the fiscal year, which began on October 1, the deficit (the difference between revenues and spending) was 11 percent higher than the same two months last year. And this despite revenues (taxes from individuals and corporations) setting records. The $433 billion the government collected in October and November was $13 billion more than it collected in the same period last year, and $11.3 billion more than it collected the year before. What a perfect definition of the American economy! Papier-mâché is defined as a “composite material consisting of paper pieces of pulp, sometimes reinforced with textiles, bound with an adhesive such as glue, starch, or wallpaper paste.” Add in a dose of political promises that everyone knows cannot be kept – not even close – and we have the American economy. The federal government ran a deficit of $666 billion in 2017, reported the U.S. Treasury Department on Thursday, thanks mainly to increases in budget items that supposedly can’t be cut: Social Security, Medicare, Medicaid, and interest on the national debt. In addition, military spending is due for substantial increases under the Trump administration. That’s the day before the end of the government’s fiscal year, and closely coincides with the moment when the Treasury will be unable to pay the government’s bills. The Treasury’s cash balances are expected to drop close to $25 billion in September, dangerously low when compared to the government’s budget of $4 trillion. Deciding to move on following the failure of the Senate to pass the “skinny” ObamaCare repeal bill, the Trump administration announced on Monday its accelerated plans for passing its budget bill. According to Marc Short, President Trump’s director of legislative affairs, background work on the budget will take place in August in preparation for committee action in the House in September. Assuming little resistance there, Short hopes for a floor vote in October, a Senate vote in November, and the president’s signature on it immediately thereafter. It’s good to dream big. Will Mulvaney Have Any More Success with MAGAnomics than Stockman did with Reaganomics? After serving in the House as a Republican representative from Michigan, David Stockman served as President Ronald Reagan’s OMB director from January 1981 until he quit 4½ years later in frustration. He got half of Reaganomics passed – the tax reduction part. He failed in getting the other half passed – the government spending cut part. 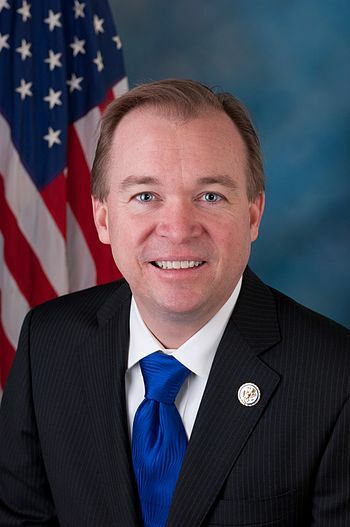 Mick Mulvaney is now Trump’s OMB Director after serving in the House as a Republican from South Carolina. And his job is likely to be as difficult and frustrating as was Stockman’s. It’s far too soon to speculate about Mulvaney. The projected rise in [annual] deficits would be the result of rapid growth in spending for federal retirement and health care programs targeted to older people, and to rising interest payments on the government’s debt, accompanied by only moderate growth in revenue collections. 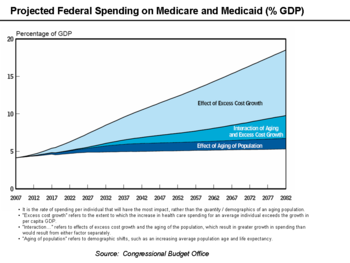 Medicare and Medicaid as % GDP Explanation: Eventually, Medicare and Medicaid spending absorbs all federal tax revenue. The U.S. Treasury announced on Thursday that the federal government collected more money in May than in any other month in history: $240.4 billion. In the same breath, it said that the government spent $328.8 billion, creating a deficit of $88.4 billion. From a wage earner’s perspective, it meant that in May the average worker paid $1,572 in taxes but the government spent $2,149, making up the $577 difference by borrowing. Such deficit spending is making the S&P Global credit rating agency increasingly nervous. Some of the [Trump] Administration’s policy proposals appear at odds with policies of the traditional Republican leadership and historical base. That, coupled with lack of cohesion, not just across, but within parties, complicates the ability to effectively and proactively advance legislation in Congress, particularly on fiscal policy. Taken together, we don’t expect a meaningful expansion or reduction of the fiscal deficit over the forecast period. And what does it say about what’s likely to happen over that “forecast period”? The U.S.’s net general government debt burden (as a share of GDP) remains twice its 2007 level. While, in our view, debt to GDP should hold fairly steady over the next several years, we expect it to rise thereafter absent measures to raise additional revenue and/or cut nondiscretionary expenditures. Although deficits have declined, net general government debt to GDP remains high at about 80% of GDP. Given our growth forecasts and our expectations that credit conditions will remain subdued, thus keeping real interest rates in check, we expect this ratio to hold fairly steady through 2020. At that point, it could deteriorate more sharply, partly as a result of demographic trends. Translation: Deficit spending will remain “subdued” for three and a half years, and then Katy bar the door! Federal debt held by the public, defined as the amount that the federal government borrows from financial markets, has ballooned over the last decade. In 2007, the year the recession began, debt held by the public represented 35 percent of GDP. Just five years later, federal debt held by the public has doubled to 70 percent and is projected to continue rising. Debt has not seen a surge this large since the increase in federal spending during World War II, when debt exceeded 70 percent of GDP. The budget office projects that growing budget deficits will cause the debt to increase sharply over the next three decades, hitting 150 percent of GDP by 2047. So, that ratio of government debt compared to the country’s economic ability to produce goods and services was 35 percent in 2007, is now 70 percent, and will soon be 150 percent. The majority of the rise in spending is largely the result of programs like Social Security and Medicare in addition to rising interest rates. For example, Social Security and major health care program spending represented 54 percent of all federal noninterest spending, an increase from the average of 37 percent it has been over the past 50 years. It appears to be an unstoppable locomotive. Non-discretionary spending (spending already locked into place by past Congresses and fully expected to be received by its beneficiaries) is on autopilot. And interest rates now coming off historic lows are only going to increase those annual deficits into the future as far as the eye can see. Large and growing federal debt over the coming decades would hurt the economy and constrain future budget policy. The amount of debt that is projected under the extended baseline would reduce national saving and income in the long term; increase the government’s interest costs, putting more pressure on the rest of the budget; limit lawmakers’ ability to respond to unforeseen events; and increase the likelihood of a fiscal crisis, an occurrence in which investors become unwilling to finance a government’s borrowing unless they are compensated with very high interest rates. Which brings one to the ultimate rhetorical question: What happens when even those “very high interest rates” aren’t enough to compensate those investors for the risks they are taking by loaning their money to a government that increasingly isn’t able to pay its bills and must continue to borrow increasingly massive amounts to cover its deficits? What happens next? Perhaps without knowing it, Moody’s downgrade of China one full notch on Wednesday exposed the fallacy of managed economies: that government bureaucrats with fancy degrees from the University of Chicago, Harvard, or Yale know what they’re doing. One of those fallacies that have been promoted for years came from Yale grad Arthur Laffer as far back as the Reagan administration. On the surface it sounds eminently logical: cut taxes and the economy will grow. The fallacy is knowing just how much to cut, whose to cut, when to cut, and how long to cut.